Trade shows are no longer simply product exhibitions: Education and networking sessions have become essential components to a show’s success. Coverings has expanded this formula to include installation vignette’s that, built over the course of four days during the show, demonstrate the versatility and variety of applications for ceramic tile. 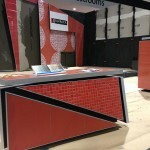 The Installation Design Showcase has paired four local, Atlanta-based design firms with four installation teams that have achieved the National Tile Contractors Association (NTCA) Five Star Recognition, and have been certified by the Ceramic Tile Education Foundation. 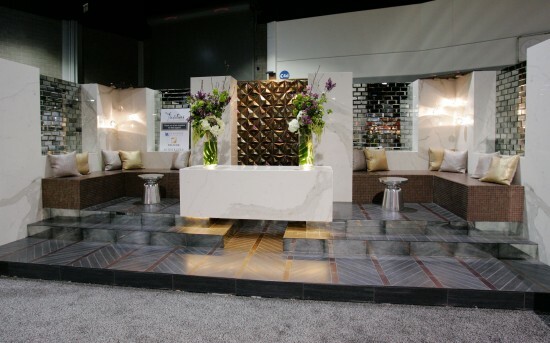 Now in its fifth year, the teams will produce a bar/lounge; a hotel lobby; an in-patient room in a women’s birthing center; and a master bathroom, all designed to demonstrate the design possibilities of tile and stone. Michael Nieswander and Margaret Nysewander, ASD Inc. 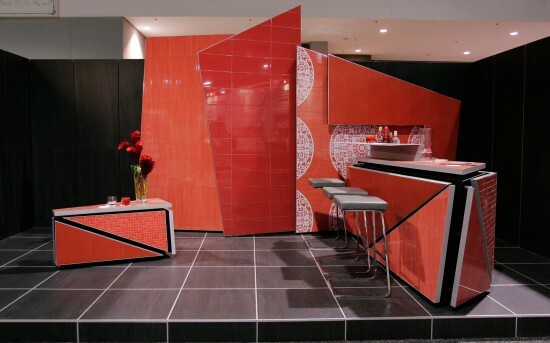 In the Bar/Lounge installation (above), designer Nysewander has called a bar of red tiles from Ceramics of Italy manufacturers “a conceptual art piece.” Highlighting the installation strengths of Rimrock Design, the bar’s design calls for varying cuts in the tile to produce unique textures across the surface. 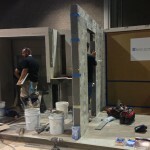 The lounge walls are clad in large-format, gray tiles with MAPEI installation products. For designers accustomed to working on large hotel lobbies such as the Hilton McLean Tysons Corner Hotel and the Gaylord Nashville, their challenge was to recreate spacious grandeur on a smaller scale. Using Plane, a 5- by 10-foot engineered porcelain ceramic wall panel from StonePeak Ceramics, the team recreates the luxury of Calacatta Borghini marble with a more thin, lightweight, and monolithic material at a fraction of the cost. 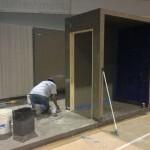 A team of installers from C.C. 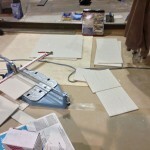 Owen Tile Company, Inc. worked with the latest in large format tiles. Glass and mirror tile from Traditions in Tile are secured with TEC installation materials. Italian wall tile that mimics a lightly colored fabric invokes serenity and relaxation, along with a warm, wood-look porcelain tile for the floor. 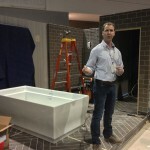 “The porcelain tile from Italy will work well with the walls,” said Mary Porter. 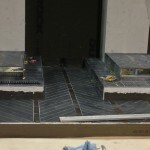 The David Allen Company set the porcelain with Strata Mat, a new coupling membrane from LATICRETE that creates a barrier between the tile and concrete for crack isolation protection essential to healthcare facilities. 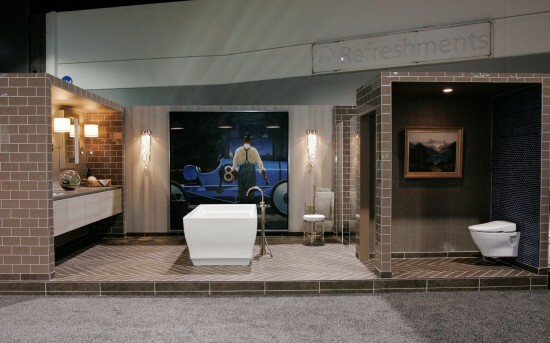 Timely invocation of a 1920s Gatsby aesthetic coincides with Baz Luhrmann’s film release to define a masculine master bath with Art Deco undertones. 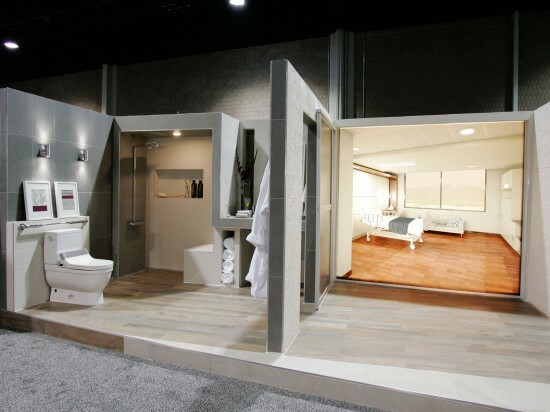 Products from the Noble Company, TOTO, and Crossville are combined to create neutral walls, blue glass tile accents, and a herringbone-patterned floor. “We used color where we want you to look,” Williams said. Collins Tile and Stone set Crossville’s ultra thin Laminam wall tile with MAPEI installation materials.